2014 Upgrades Include: 1. Improved GT5 Engine Kit 2. 24 to 40 mph, depending on the gear ration and weight 3. 125-150 miles per gallon 4. Kit comes with EVERYTHING needed to mount your bike – ride the same day 5. Independent drive sprocket and chain 6. Japanese Bearings for a long-life 7. Easier to mount on fat tube bikes The Black or Silver Engine Kit comes complete and can be installed within 2-4 hours using basic tools. This engine first most 24″ and larger wheel bikes, such as Mountain, Cruiser, Chopper and Road bikes with a V-frame. Please contact us if you should have questions. Package Includes: 1. Black or Silver Slant-Head Motor 66/80cc 2-Stroke EPA Engine 2. Low Profile Carburetor 3. Upgraded Hush Muffler 4. Clutch Cable 5. Drive Chain Idler 6. High Quality Japanese Main Bearings 7. 415 Heavy-Duty Chain 8. Chain Tension Guide with Bearings 9. Chain Guard 10. Spark Plug 11. CD Ignition Coil 12. Upgraded Alloy Push Clutch Lever 13. Upgraded Twist Throttle and Cable With Grip 14. Universal Mounting U-Bolt mount 15. Black Teardrop Gas Tank (2 Liter Capacity) 16. Fuel Line 17. Throttle Cable 18. Clutch Cable 19. Gasoline Tank Switch 20. Sprocket Clamp Assembly 21. Sprocket Clamp Bolts 22. Large Spring (Heat Shield Spring) 23. Extension Spring (Recoil Spring) 24. High Quality Needle Bearings on Both Ends Crank 25. 44 Tooth Chrome Sprocket with 9 Holes 26. Magneto 27. Kill Switch 28. Bonus: Sprocket Removal Tool 29. Bonus: Spark Plug Removal Tool 30. Bonus: Fuel Filter 31. All the Needed Mounting Brackets, Gaskets, and Hardware 32. FULL TECHNICAL SUPPORT, contact our office for assistance. *** Bicycle kits are not for everyone, must have some mechanical skills to complete this kit. Bicycle Motor Works offers technical and customer support. ** Bike not included. Photos of built motorized bikes are expamples. * Unlimited technical assistance, no returns or warranty, must report any damages within 24 hours of receiving product.Performance enhanced GT5 model, for a more durable, powerful engine! 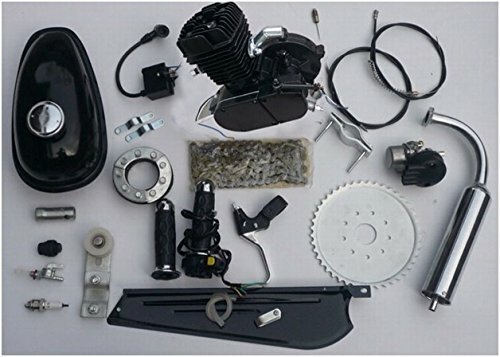 This kit includes everything your need to motorized your bike, all you need is your tools. Bicycle Motor Works offers unlimited technical support with every kit.